You are here: Home / Blog / Aviation News / Beechcraft Bonanza V35TC Rebuild or Part Out? Beechcraft Bonanza V35TC Rebuild or Part Out? Propellerhead Aviation, in conjunction with Fast Aviation and HangarSwap, will be restoring this V35TC Beechcraft Bonanza OR parting it out – all depending on the initial inspection and cost assessment. Follow us for the technical aspects of this Beechcrafts fate. 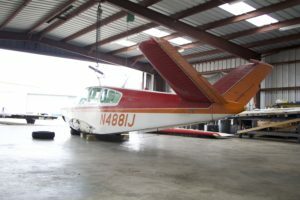 Upon arrival at Propellerhead the fuselage was carefully hoisted off the trailer and placed on the floor. Unfortunately, we DO NOT have the genuine Beech fuselage jack which would make things a lot easier so we’ll adapt and fabricate a similar structure to support and manipulate the fuselage until the wings are installed. The next order of business is to gather all information on the airframe, engine and propeller. It appears to be somewhat of a rare model of the V35 being a first year factory turbocharged unit with Beech building only 79 airframes during the 1966-1967 timeframe. Does anyone have the data to determine which of these year airframes are still flying? Watch this video and help us determine whether or not this airplane should be restored or sold for parts. https://propellerheadaviation.com/wp-content/uploads/2018/01/IMG_7026.jpg 4000 6000 Bill Boege http://angelic-treasure.flywheelsites.com/wp-content/uploads/2015/03/White-Propellerhead-Aviation-Logo1.png Bill Boege2018-01-02 00:05:082018-01-02 00:05:08Beechcraft Bonanza V35TC Rebuild or Part Out?